Sometimes Task manager and registry editor is disabled as a result of Virus effect. Stopping or killing a Windows process during this requires workaround with manual method [alternatively, use free utility to enabled disabled Window features]. 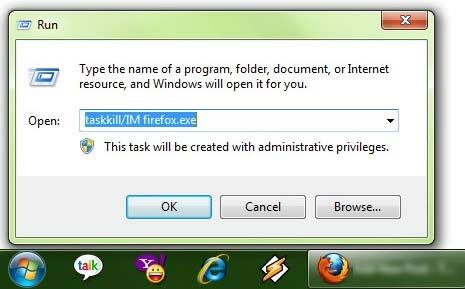 You can easily kill any Windows process manually using taskkill command. Here are different ways to use this command. Recall the name of the erroneous process, for example firefox.exe, now use the following command in a command prompt in Windows XP (goto Start > Run, type cmd & press OK to see command prompt window. One Windows 7, you can simply run this command in Run dialog box (as in screenshot below). This will cause the program to terminate gracefully, asking for confirmation if there are unsaved changes. To forcefully kill the same process, add the /F option to the command line. Be careful with the /F option as it will terminate all matching processes without confirmation. Using either instance of taskkill command you can terminate (kill) any Windows program without the use of task manager on Windows computer.